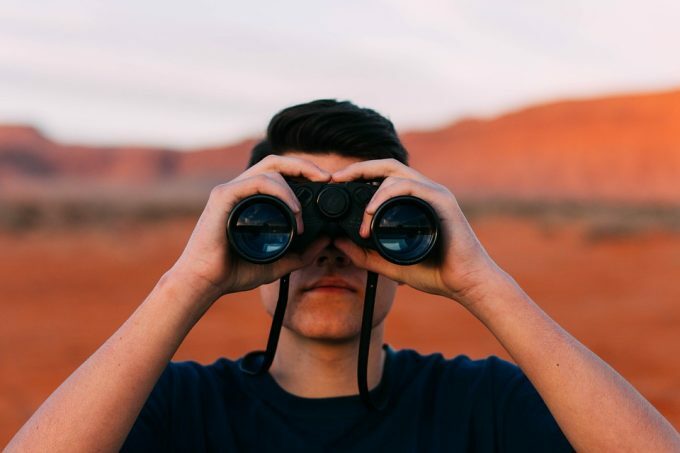 From viewing sporting events to spotting your target outdoors while hunting, you need the best binoculars under 500 to achieve this. Using the correct binocular makes a huge difference when required to scan fields from long distances for hours. View images brighter and sharper, making sure you observe everything from the smallest butterfly to a large white tail. 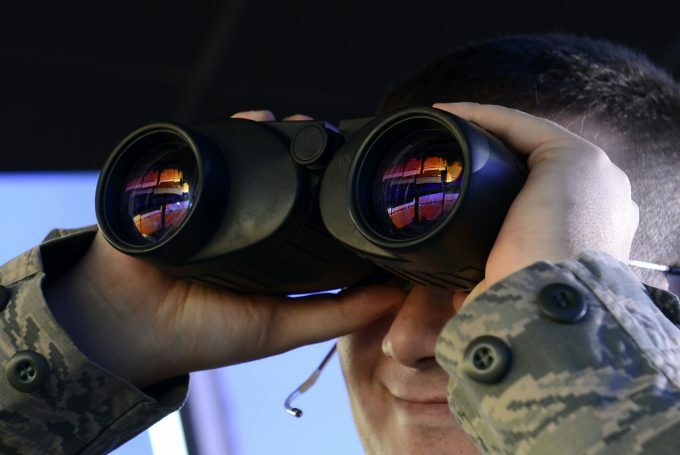 You may think buying a pair of binoculars for fewer than 500 bucks does not give you a high-quality optic. You will be surprised as some of the models reviewed here have high-quality glass, lens coatings, frame materials, and prisms. With the superb multicoated lenses, you can see brighter images in low-light conditions and experience fewer glares when used in bright light locations. The close focus is the minimum distance to which the binocular can focus. When choosing a pair of binoculars with a 9.8 feet focus this means that the model cannot focus on anything that is closer than 9.8 feet, such as smaller insects. This feature shows the distance from the eyepiece when observing the field of view. This is normally a great characteristic to look for if you wear glasses. The manufacturers make it easier for you as they design the binocular with pop-up and twist-up eyecups. The field of view normally measured at 1,000 yards. The larger the FOV, the wider the area is visible to your eye in the eyepiece. 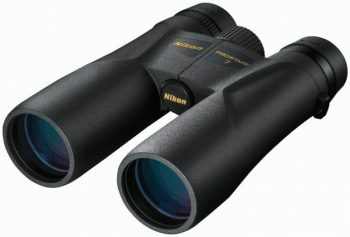 Using 8 x 42 pair of binoculars you have a wider field of view, you will see less compared to using a 10 x 50 model. An important feature is the lens coating as the common knowledge is that light reflects off glass surfaces and cause glare. The great advantage of choosing one of the binoculars on the comparison list is that all them have multi-layer coatings to help reduce glare and improves the light transmission. This informs you of the type of glass uses and stands for High Definition and used in digital lenses. This stands for Extra-Low dispersion and is great when viewing objects at a high magnification as it allows for color fringing. This is a great feature if you view swans as their color is white and brings out the birds color compared to using a traditional lens there is a chromatic aberration found at the border or background of the white sections of the bird. Using a lens with multiple coatings helps maximize the light transmitted to your eyes. This, in turn, reduces the glare and increases the clarity of the image you are viewing. Although we have not indicated, the size and weight of the comparison list this remains an important factor when choosing a pair of binoculars. You can buy them in different sizes from large too small. 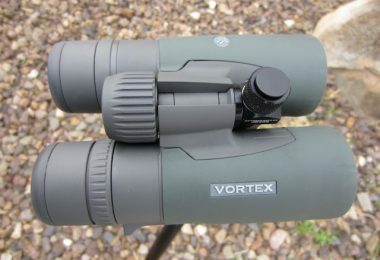 The binoculars reviewed here are in the mid to full-size range. Here you need to consider the weight as the equipment will be hanging around your neck most of the time. Consider what you will be using them for and the long hours of use as a pair with a hefty weight can tire you out. If you need the best binoculars and have limited finances, choose one according to the highest quality available in our reviewed section. Each one has their own unique features best suited for your lifestyle and budget. 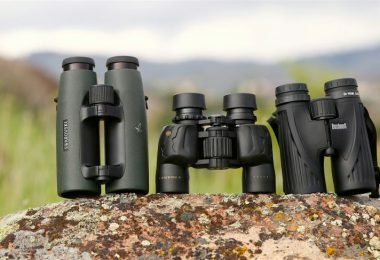 Description: The Bushnell Excursions are available in two magnification models the 8X and 10X, further the color styles Euro Green. The binocular has a BAK-4 roof prism design and is lightweight enough to take anywhere while traveling. The lockable center focus knob is large and gives you a precise focus. The glass is lead-free and multicoated with PC-3 phase coating and high definition glass. The complete unit’s nitrogen purged making it fog and waterproof to use in any weather conditions. The binocular easy to use and with the focus that locks it is handy. The device has twist-up eyecups and gives you a close focus of 6.5-feet. They eye relief is 15.5mm and gives you an exit pupil of 4.2mm and weighs 23.5 oz. Further, there is a soft touch thumb grip for comfortable holding when viewing objects for hours. Related: Can be used with a Tripod. This will allow you a very stable view of a given area without wearing out your arms. 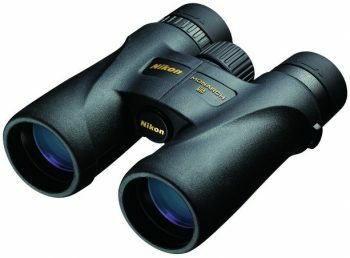 Description: The Nikon ProStaff 7 is a full-size terrain binocular and one of the best ATB binoculars available in the collection. You can buy the device in two magnification settings 8X and 10X and both have multicoated lenses with high-resolution viewing. The equipment is fog, waterproof, and great for hunters to use when outdoors and it happens to start raining. Further, you have a 15+mm eye relief, the rubber eyecups turn and slide and for ease of adjustment, it has a diopter. The body is rubber-armored and has sleek contours for the best grips and the optic has a lead-free Eco-Glass. 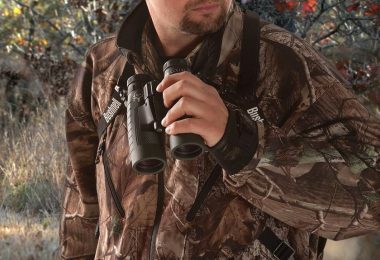 The ATB binocular delivers a close focus range of up to 13-feet on all the models. The FOV ranges from 330-feet in the 8X and 314-feet in the 10X. If you do suffer from a perceptible handshake, the 8x42mm is perfect as many users found it worsened with the 10x42mm. 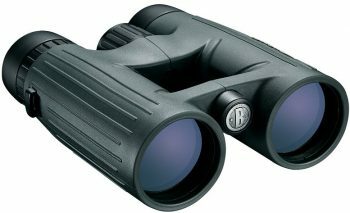 Description: The Bushnell Legend binocular is one of the best in its class. With the anti-reflective coating on the lens, you get the superior light transmission. Bushnell has used ED prime glass for viewing images sharp and true to its color. With the RainGuard technology, you can feel confident to use the binocular outdoors in any weather condition. You can buy the Legend in two color designs black and Camo. 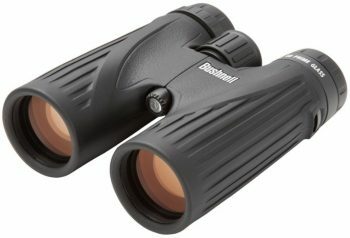 The other amazing thing that makes the Bushnell one of the top binoculars under 500 is the extra-low dispersion glass as it eradicates chromatic abnormality and bringing distinct details when used in low-light conditions. Other standout features it gives you an FOV 340-feet, the exit pupil is 2.56mm and eye relief of 15.2mm. The binocular has twist-up eyecups pushes up to two positions for eye relief. You can mount the equipment to a tripod with a tripod adapter. The binoculars have a centered focus piece and with locking diopter ring to adjust the right-eye if needed. Description: The Nikon Monarch 5 is lightweight compared to its predecessor and you can easily take it with you on your next hunting trip. Use it with ease even while wearing glasses as the device gives you clear FOV of 330-feet and eye relief of 19.5mm. Nikon used eco-glass with a multilayer coating for bright lighting transmittance. This helps to minimize loss of light caused by a reflection giving you a clearer natural view. The eyecups are turn-and-slide to help adjust the eye relief making them custom fit with a full FOV. The structure of the binocular is armored coated protecting it from damage when it falls and has a non-slip grip. The central focus knob is smooth to use and is both fog and waterproof. Further, it has an extra-low dispersion glass. 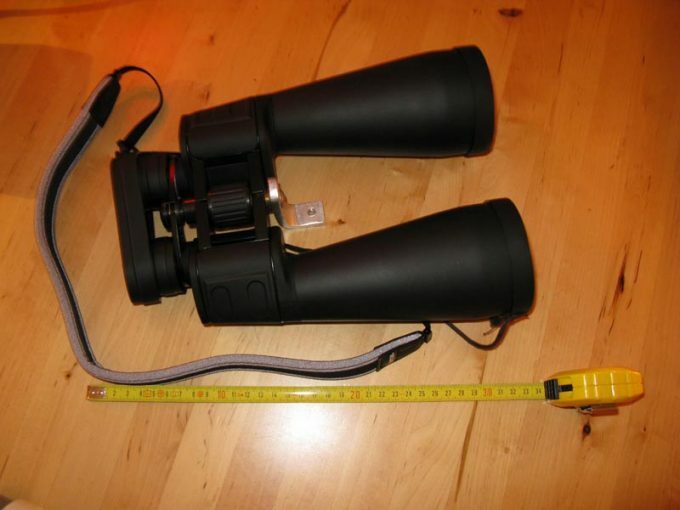 You can buy the binocular in three different optic sizes 8×42, 10×42, and 12×42. 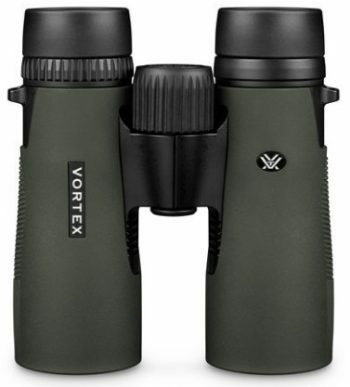 Description: The Vortex Diamondback has a short hinge design leaving more room for your hands to hold the binoculars. For increasing light transmission, the air-to-glass surface has multiple anti-reflective coatings. The binocular is argon gas purged and O-ring sealed making it fog and waterproof. This is one of the best binoculars under 500 to use outdoors with the rugged rubber armor protecting it from damage. The twist-up eyecups you can adjust to view images without your glasses and the center focus wheel adjusts both barrels simultaneously. Located on the right eyepiece you find the diopter to adjust for differences in your eyes and the device is compatible with a tripod. You get an eye relief of 15mm and exit pupil of 4.2mm. The close focus range is 6.7-feet and the device weighs 21.4 oz. 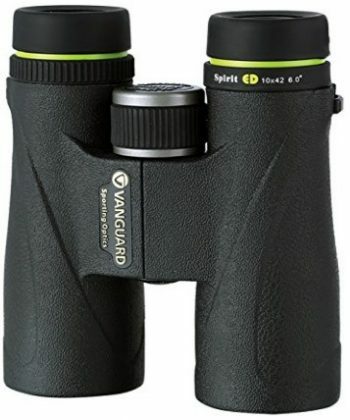 Description: The Vanguard Spirit binoculars give you superior color reproduction with the ED glass. Further, a BAK-4 phase coated prism is multi-coated. The eyecups give you long eye relief up to 293-feet with the two-stage twist out eyecups. The device is suitable to use in weather conditions with the fog and waterproof design. Use it in low light conditions with the advanced lens coatings as it gives you the perfect viewing experience. The contour of the unit is lightweight and only weighs 29.8-ounces. Further, you have a 293-feet field of view with a 5.6° viewing angle and a near focus of 9.8-feet. Using the binocular without glasses is perfect as it gives you an eye relief of 19mm and includes a lifetime warranty. 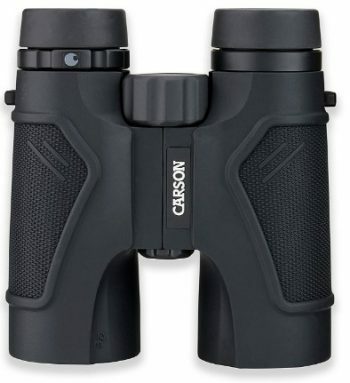 Description: The Carson 3D Series binoculars by Carson are perfect to use for your outdoor adventures as it has rubberized armor coating and is fog and waterproof. For reducing color fringing and rectifying chromatic aberration, they have made it with ED glass lenses. To enhance the resolution and contrast the phase corrected prisms come in handy. For ease of use, there are thumb grooves with a superb texture making the binocular lightweight and comfortable to hold for hours. With the twist-down eyecups, you get a long eye relief of 19.5mm and perfect for eyeglass users. The field of view while using the binocular is 341-feet and the close focus is 9.8-feet. The Carson has a center focus wheel that is easy to use. Related: We suggest you use the 3D with a Lockdown Gear S4 and helps protect the lenses. 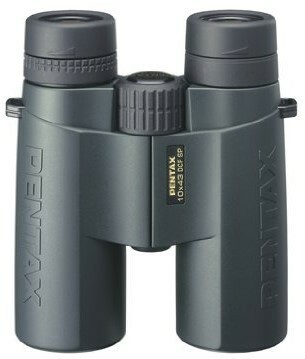 Description: The Pentax DCF SP series is a top-rated binocular with multi-coated optical elements. With the inner-focus, design the round eyepiece lenses gives you a high-resolution when viewing images. The body structure consists of magnesium-alloy and rated JIS Class 6 for water. You can enjoy from close up views too long distance viewing in less ideal weather conditions whether you wear glasses or not. For a perfect eye relief of 17mm, there are 4-stop helicoids eyepiece rings. The diopter locks and you can adjust it. Further, you have an angular field of view of 6° and a field of view of 105mm. There is a 4mm exit pupil with a minimum focus distance of 3.5m and the twilight factor is 20.74. The lightweight binocular weighs 730 grams but is not Argon filled. 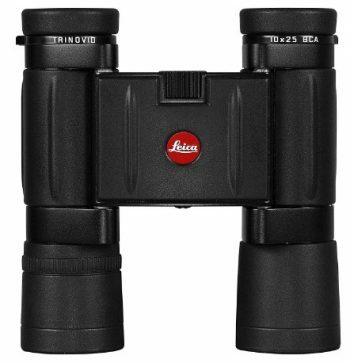 Description: For the best binoculars, less than 500 look at the Leica Trinovid that is compact and powerful. 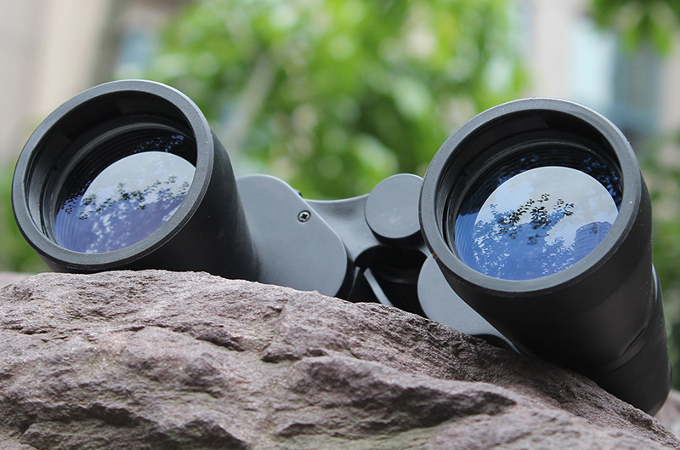 The binocular has a metal housing with rubberized armor to take with you anywhere. Further, the device has double hinges to collapse them and place in your pocket while walking. With the 2.5mm exit pupil, you can use them in good lighting condition and has HDC multi-layer coatings on the six lenses found in the unit. With the roof prism, design and central focusing knob found on the top, focusing is smooth and quick. The eyecups adjust making it suitable to use with glasses. The binoculars only water spray resistant for use in light rain and not waterproof. The field of view while using the Trinovid is 273-feet and it gives you an eye relief of 14.6mm and a twilight factor of 15.81. The close focus distance is 16.4-feet. There are countless brands and models available on the market when it comes to buying the top models under 500. We hope that our reviews above help you to find the best one suited for your individual needs. Whether you are a hunter or do nature surveillance these models will help you get the job done at the fraction of the price compared to the expensive brands available out there. Now we’d love to hear from you. 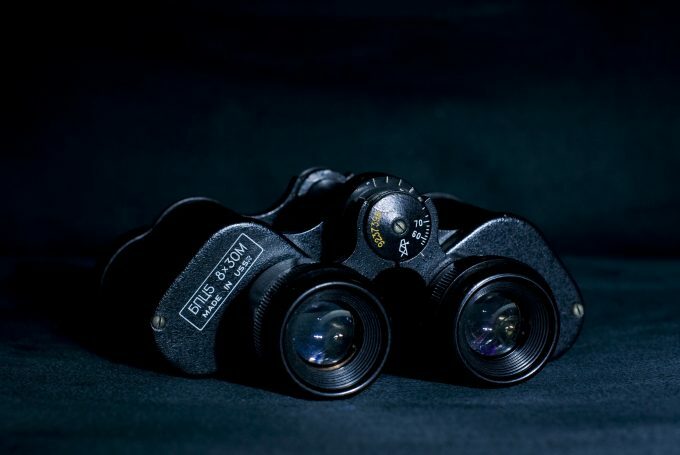 Have you used any of the binoculars that we have highlighted? If so, please let us know about your experiences with them in the comments section below.